Appearance(0-20): The cigar looked well put together,and had the usual Pepin quality. Looking at it, you can tell that it will be a good smoke. No blemishes, just some very small veins. It had a light oily look, similar to some Liga Privada’s. The band has a nice bright blue color, with the large 601 to signify the cigar. Construction(0-20): The cigar is a boxed pressed maduro, and the construction wasn’t as tight as I generally see in some other boxed pressed cigars. After smoking it,the draw was absolutely perfect. There were no issues getting smoke from it,and boy did it let off some smoke. The601 burned even and cool all the way down to the nub, with no touch ups or re-lights. Strength(0-20): The blue label wasn’t overpowering,but it wasn’t a walk in the park either. You could definitely feel this cigar if you smoke on an empty stomach. The cigar is listed as med-full, but I would say that it closer to a full medium smoke. Although not an overly strong cigar,it really makes up for it in the flavor department. Flavor(0-20): Right from the initial light, the cigar has great flavor. It starts off very spicy, and I was expecting that throughout. After about an inch, the spiciness goes away and moves more towards an earthy-woody experience. The whole stick was flavorful and very consistent from start to finish. I would be curious to have a cigar that has the spicy profile throughout that the first inch had. Value(0-20): For roughly around $8.00, the 601hold its own. There are no gripes about where this stick is priced. I’d certainly pick up another and smoke it,but it’s not a cigar that I’m busting down my shops doors to go buy. Additional Notes: No real pairing here, just a few sips of Gatorade. Smoked at Cigars International. Overall(0-100): Wrapping up, this is everything that it is advertised to be. 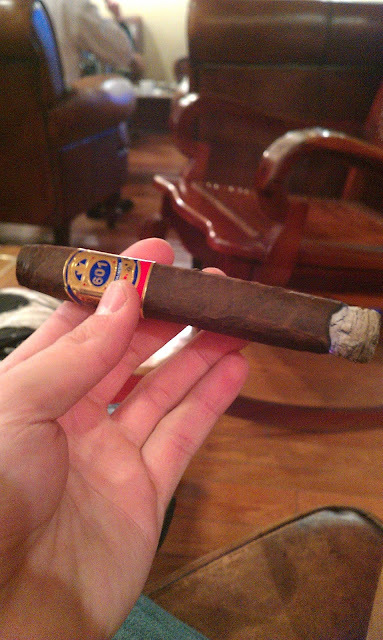 Its not a “knock your socks off cigar”, but the flavor is definitely there. It was a relaxing smoke because the draw was perfect, no touch-ups, and the ash held on like a premium cigar should. Definitely would smoke this one again.